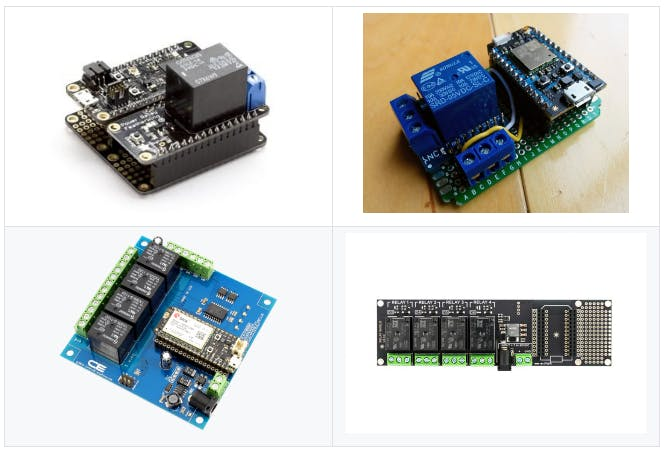 This project contains a firmware and an Ionic app to control one or more relays from an Android device. If you need to control a lamp, open your garage or control your sprinkler valve to water your lawn, this project offers a way to do that from your phone with an easy to use app provided. Few years back I got hooked in the world of hybrid apps and specifically the Ionic Framework. Anyway, I decided to create this firmware and an Ionic app that goes along. And what better time to share it with everyone than now that the new Particle Mesh devices are out! While it deserves a write up on its own, in the meantime know that it's built with Angular, HTML and CSS. All those things get combined beautifully in Ionic. To control your relays, swipe your finger left on top of the relay you want to control to expose the buttons menu, and hit the on, off or pulse buttons. 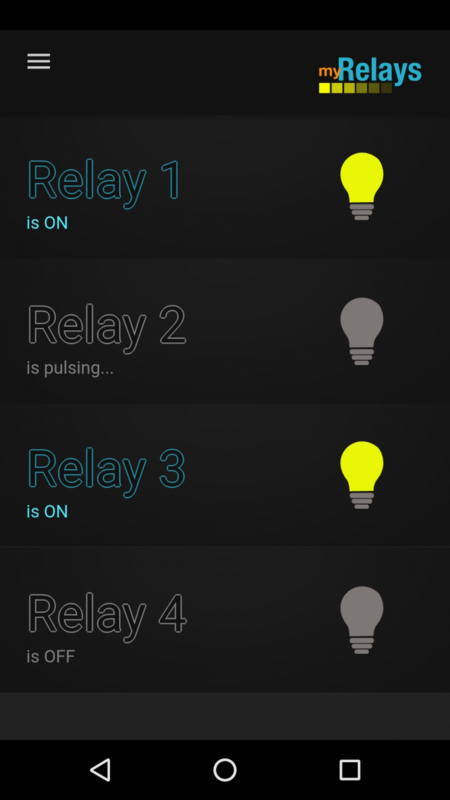 Hitting the pulse button will turn on the relay for a number of milliseconds. This can be changed in the firmware. The app contains a couple of animations made with Lottie. Thanks to an Angular library called ng-lottie, we can use them on our Ionic apps. And after many hours in Adobe After Effects, the results can be pretty cool. NCD boards with 1 or up to 24 relays! STEP 1: Assemble your relay board. Depending on the one you choose you may have some soldering to do. STEP 2: Customise the firmware. You can grab the myRelays.ino firmware from the git repo or import it in Particle Build with this link. Tip: You can configure D7 in that line above to play with the on-board led! Note: remember that the relay you connect to your device must be a 3.3 volts input relay. A 5 volts relay may not work at all. STEP 3: Flash the firmware on your device. STEP 4: Install the app on your Android device. While I get it through the Google Play process of publishing an app, you can enjoy it right away from this link on My Google Drive. I have tested this apk on a Nexus 5 and a Pixel 2. Note: there is some sort of magic with these apk files that I'm trying to figure out. Leave me a note below if you run intro trouble while installing it. STEP 6: Hit the Done button at the bottom and go back to the Relays screen. Your relays status should refresh automatically! 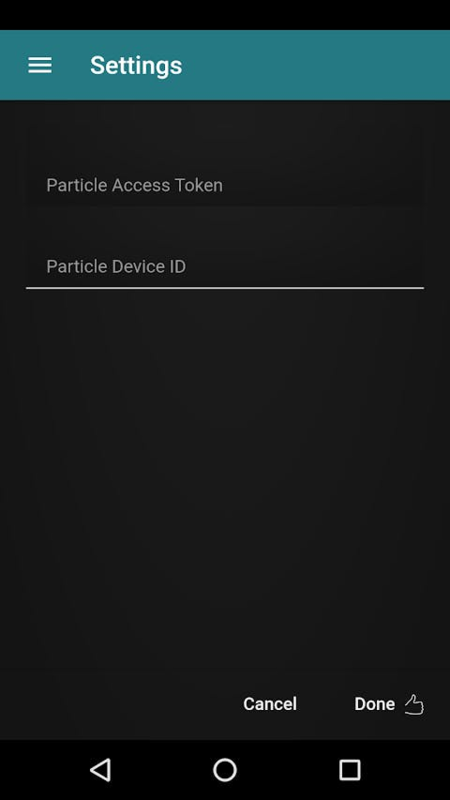 Since the app stores the Particle Access Token on the Android device in order to communicate with the Particle Cloud and your Particle device, it is recommended that this app is only used on Android devices you own.